On Monday, Debra Hamel launched her latest book: It was a Dark and Stormy Tweet. It is both a compilation of tweets and a survey of what makes these particular tweets special, and it makes extraordinarily compelling reading. DH: TwitrLit is a literary site that I created back in April of 2007. 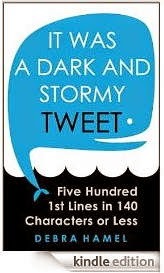 Twice a day, in the morning and evening, I post the first line of a book on TwitrLit. The trick is that I don't identify the book by author or title. I just provide the first sentence of the book's first chapter and a link to the book on Amazon. Readers who are sufficiently intrigued by the line can click through to Amazon to find out what book it's from. The lines appear on my web site, TwirtLit.com, and also on the site's associated Twitter account, @TwitrLit, which is how most people get my updates. I've now posted more than 5000 lines on TwitrLit. Readers can find them all posted at TwitrLit.com. There are also a number of Random 1st Line-Inators in the sidebar there: click on one and a random line will pop up in a new window. Then click the "see another" link, then click it again.... I find myself doing this more often than I should. It's somehow transfixing having them come at you randomly like that. "But in case it takes a while, we might as well have toilet paper." "We forgot about incinerating our excrements." front door, for obvious reasons." CD: In the book you have managed to come up with some classifications e.g. those that are variations on a famous first line - what is your favourite way of starting a book? "I celebrate the dawn of my seventy-fourth birthday handcuffed to a lead pipe." How could you not want to read more? "I did two things on my seventy-fifth birthday." CD: Is there one featuring snails? down at the path, saw a snail." I've included this one in a chapter titled "Simply Put," which includes lines that aren't meant to shock or surprise. They're simple declarative sentences which, however, can be unexpectedly charming. CD: Some of these feature first lines from children's literature - are there distinctive differences between adult and children's first lines? Are there some that only feature in one and not the other? DH: I think it's probably easier to find a good first line in a children's book than it is to find one in adult books. At least for my purposes. Children's books tend to have shorter sentences, so a greater percentage of the first lines I come across when looking at children's books will fit in a tweet. But also there's usually a charming simplicity about the first lines of children's books. The first lines of adult books can be complicated and boring sometimes. CD: Have people come up with any good uses for these first lines - apart from the author's use in a book? think she's doing it anymore, but it seems like a great idea. CD: As a writer yourself - how do you come up with your first lines? Is there one you are particularly proud of? "Neaira grew up in a brothel in Corinth, a polis in Greece's Peloponnese famous enough for its prostitutes that the ancient Greeks made a verb out of it: korinthiazein meant 'to fornicate.'" "Egyptian women urinated standing up." I don't think I have any particular method for coming up with first lines, but I've always thought that they're very important in terms of making a good first impression on readers. CD: Do you think last lines would be similarly interesting? DH: Maybe so, but I would never publicize them as I do first lines. I'm one of those people who won't allow myself to look at a book's last page until I've gotten there by reading. You have to earn it. And hopefully, once you've earned it, the last line will be worth the effort of having got there. Come to think of it, I've probably put at least as much effort into my last lines as my first lines. So I do believe very much in their importance to the reader's experience as well. It was a Dark and Stormy Tweet is available in Kindle and paperback from Amazon.